Twice a month, a different FADER staff member will pick a clothing item or accessory that he or she has lately been spending a lot of time with—or would like to—and write a little love letter to it. We would’ve done a column on who we’re dating but that seemed a little bit much. 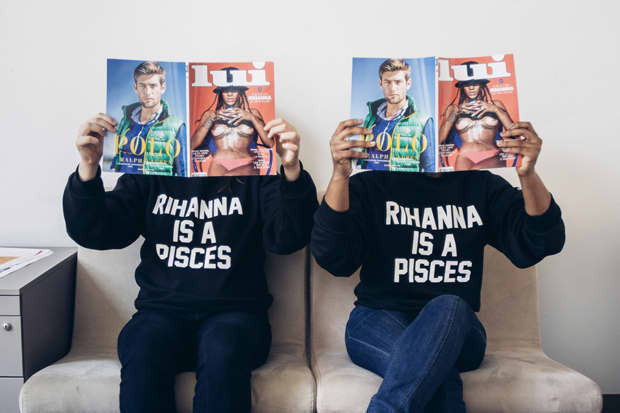 This week, Emilie Friedlander and Deidre Dyer talk Private Party's Rihanna is a Pisces Sweatshirt, and what it means to be the fishiest sign in the zodiac. Pisces have a reputation for being some of the most world-weary, sad-sack creatures in the zodiac. It’s sort of a strange point of pride for us watery types, to the point that two pisces coming together will inevitably share a sort of “oh yeah, nobody feels the pain of life on this earth as profoundly and poignantly as us” bonding moment. 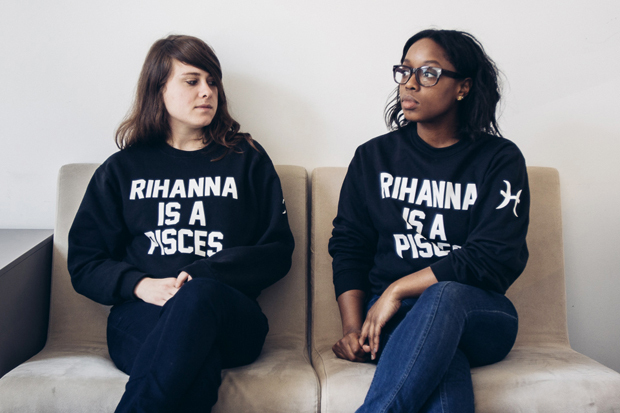 It’s probably pretty insufferable for everybody else, but what I love about this Rihanna Is A Pisces sweatshirt is it literally lets you wear your sign on your sleeve, so that people who don’t know you can have some idea of what they’re getting into before they decide whether to come up and talk to you. Also, the letterman jacket style font literally makes me feel like I’m part of a team, which is a pretty necessary feeling for a pisces to have, since they feel like outsiders so much of the time. Emilie and I sit catty-corner to one another in our intimate office, which seems like an appropriate position for two pisces who have polar opposite temperaments. Often times I'll be cracking a joke that is likely too offensive, and Emilie will let out a heartfelt sigh, sympathizing with the object of my ridicule. Yet, even from our opposite ends of the behavioral spectrum, the duality in our nature allows us to flip-flop and still identify with one another on a deeper level. We often say that we feel the same thing but react differently, and our running joke is that I'm crying deep on the inside and that she's just crying. As the super sensitive fish of the zodiac, we're prone to worrying about others more than ourselves, wanting the best for everyone else. After spending so many months tied to one another's heels at work, our weeping and laughing selves have balanced out and, whether it's through sharing sandwiches or ladies' room heart-to-hearts, we look out for each other and have reached an equilibrium that feels quite alright.